Building a work wardrobe can seem like a daunting task when you first get started. What shoes are too casual, and which are too dressy? Are jeans okay to wear to the office, and if so, how should they be worn? There's also a question of efficiency when it comes to getting ready for your workday. You need to be out the door fast with the help of a few reliable work essentials you can create outfit formulas from. The key to creating a variety of looks with a few pieces is to choose classic silhouettes in versatile colors that can be easily mixed and matched. With a small selection, you can create a variety of chic outfits for the entire year. Keep reading for the five essential pieces you need to create the perfect work wardrobe. 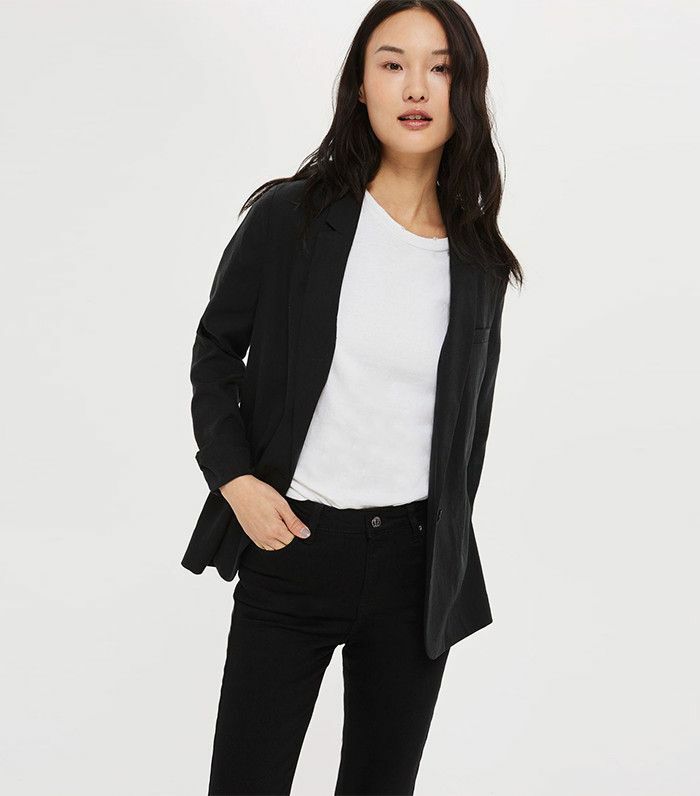 Take the typical work blazer to next level with a slight adjustment to its silhouette. Instead of a tightly constructed look, go for a relaxed boyfriend fit. This dresses up an outfit for the office without looking too stuffy. Throw it over a dress or a casual shirt and jeans—it's versatile enough to be paired with other pieces in your work wardrobe. Investing in a stylish wrap dress is an instant way to throw together a chic look for work. Wrap dresses cinch the waist and are loose around the hips for a flattering A-line silhouette. Creating work outfit formulas is made simple with the right wrap dress—all you need are the right shoes and accessories. The V-neckline is just right for a bold statement necklace. Pair it with a pair of block heels for all-day comfort with a little added height. No work wardrobe would be complete without a white button-down. A good white button-down brings a crisp look to your work ensemble. Similar to the blazer, a stylish take on the button-down is to choose a loose, breezy cut that can be tucked in or left loose. Pair it with a bright shoe or necklace for a pop of color. Creating work outfit formulas is easy when you have the perfect pair of versatile trousers. Cropped trousers add a classic silhouette to a look that captures a sort of French je ne sais quoi. Choose a pair that hits directly above the ankle. This cut also looks great with any style pant leg, whether you prefer wide, tapered, or flare. To complete your look, top it off with a pair of block heels. Block heels are the middle ground between a flat and a stiletto. They add height, but they are still sturdy enough to comfortably run around the office in. Unlike a stiletto, the chunkier heel provides better weight distribution along the foot so you can avoid the usual pangs that come with a long day in heels. Next up, read seven easy ways to make your favorite pair of jeans work at the office.